The race consists of a 5km and 10km walk or run route which begins and ends at Marks Park Sports Club. Entries are limited to 16 000 participants. You can enter at a selected SPAR STORE or ONLINE. An admin fee will be applicable for online entries. Pre-entries at SPAR stores and online entries will close on 24 September 2018. Entries will still be open at Marks Park Sports Club from 4 -6 October 2018 between 10h00 and 18h00 and on race day from 06h00 – 07h30 (if available). T-SHIRTS ARE ONE SIZE FITS ALL. LOST OR FORGOTTEN NUMBERS WILL BE CHARGED FOR AT FULL PRICE. NO REFUNDS WILL BE GIVEN. When you enter you will receive your race number, a t-shirt (one size fits all), and a copy of the My Joburg Race magazine. If you have entered ONLINE please bring your proof of payment to collect your race number, t-shirt (one size fits all), and a copy of the My Joburg Race magazine at Marks Park Sports Club from 5 -6 October 2018 between 10h00 and 18h00 and on race day from 06h00 – 07h30. DO NOT COLLECT FROM SPAR STORES IF YOU HAVE ENTERED ONLINE. Men are allowed to participate in the race,but will not be eligible for any prizes. They will however receive a goodie bag. No GAS ‘braaiers’, GLASS, ALCOHOL, COOL DRINK CANS or TINS will be allowed inside Marks Park Sports Club (PLASTIC ONLY). No selling of any goods will be permitted on Race Day. There will be food and beverages for sale on Race Day. There will be refreshment points at regular intervals along the race route. Medals are handed out on Race Day once you have crossed the finish line. Goodie Bags are handed out on race day in clearly marked, designated areas, on the field, after the race. Provision will be made for disabled participants. Results of the race will be published on www.finishtime.co.za. SPAR Women’s 10km Challenge is only open to female runners aged 15 years and older. SPAR Women’s 5km Run/Walk is only open to females over the age of 9 years. The prize winners are determined and verified by the referees. Age category ID tags must be worn on the front and back of athletes competing for age category prizes. No runner will be eligible for an age group prize unless he/she has worn a tag throughout the race. Proof of age to be produced on request on race day. Juniors to produce original birth certificate or ID document. No seconding is permitted. All runners must obey marshals and traffic officers at all times. The cut-off time for completing the 10km Challenge or 5km Run/Walk is 120 minutes. Regret, no mechanically operated devices, blades, cycles or wheelchairs are permitted to participate in the race without special permission granted by the organisers. The race is held under the rules of ASA and CGA. Athletes not belonging to a club must wear the issued temporary licence number on the back and the issued race number on the front of the vest (for 10km race only). Athletes may qualify for the open category plus the category which they have entered. Registered athletes must be members of a club affiliated to ASA; and must wear their club colours and the two 2018 provincial licence numbers on the back and front, and the issued race number on the front of the vest, not obscuring the licence number. Objections must be lodged in writing within 30 minutes (before or after prize-giving) to the chief referee, accompanied by R300, which is refundable if the appeal is upheld. All participants with prams must start at the back of the field so as to avoid injury to yourself, your child and other runners. Regrettably, athletes may not participate with pets. International athletes must provide a clearance letter from their country of origin to the event organiser and the chief referee before the start of the race. Athletes must comply with domiciliary rules when competing for a club prize. Men are not eligible for ANY prizes. No ipods and any music devices allowed. Participants must be medically fit and indemnify the race organisers, CGA and ASA from any and all claims which may arise from participation in the events. No refunds on entry fee. Licensed athletes who do not wear their 2018 licence numbers must purchase a temporary licence on the day or face disqualification. Licensed athletes in the 10km event, not wearing club colours may face disqualification. Facilities will be available for those who need to safely stow their tog bags and personal belongings. Look out for the well marked Tog Bag area on the field on Race Day. Our friendly staff will be there to assist you. 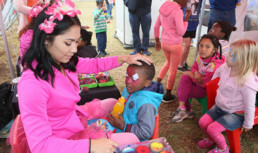 The Kidz Zone is a free and safe entertainment area where your children can take part in exciting activities. There is great fun to be had with jumping castles, face painting and various characters. Please note that it is still the responsibility of the parent to supervise their child while they play. A medical tent will be set up on the field on Race Day, with two qualified doctors and their staff. Emergency medical teams will be posted at the finish line as well as at the water points along the route. Ambulances will also be available at the stadium, on the 5km route and on the 10km route. Should you be injured in the course of the race, please report to the medical tent if possible or alert the nearest security or medical personnel. Physiotherapists will also be on duty in the medical tent providing sport massages to runners free of charge.